Without a doubt, this is the most influential spaceship design ever. 'Blade Runner' as the movies "visual futurist", is one of the handful of creatives responsible for the look of most modern sci-fi; along with Ron Cobb (who worked alongside Mead on both 'Aliens' and 'Star Wars' and also designed the Nostromo from 'Alien') these two individuals are almost exclusively responsible for the introduction of 'technical realism' into science fiction. The original script described the Sulaco in only basic cinematic terms - something about a vast array of antennas slicing laterally across frame followed by a mountain of steel. Working on this alone, Mead created a design based on a cylindrical axis with a large spherical reactor to the rear. Although this was an impressive piece of hardware, it was not what Cameron envisioned. The director expressed some ideas relating to the military feel of the movie, that the vessel should lack the scattering of lights so characteristic of a star destroyer for example, and suggested instead more of a submarine look. And that was it - from that, the critical effect was achieved. What makes the Sulaco so inspiring is the perfect balance it achieves between absolute technical realism, typified perhaps by the Odyssey in '2001' (described by Ridley Scott as a "NASA object"), and dramatic impact, like the impossibly vast, sinister wedges of the Imperial Star Destroyers. The result is a vehicle which we readily believe. This is a future world extended from the cold-war era when the movie was made; a world of austere technology and military prowess with the emphasis on stealth and the Sulaco thrusts brutally through the interstellar void perfectly into place. As to the influence of this design, there are numerous examples that can be cited. I have heard it remarked more than once that the Sulaco looks like a gun in space. The similarity to the colonial marines own M41A pulse rifles is obvious. There is a space combat computer game in which the majority of the vehicle designs follow this same principal. In fact, one of their designers said that, "they look like guns, basically", and I can't help detecting a shadow of the Sulaco in there. 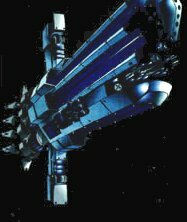 Opposite is pictured a Valiant class ship of the Jupiter forces from 'Jovian Chronicles', another submarine style design, with a forward antenna array very like the Sulaco. 'Jovian Chronicles' is a board game produced by Dream Pod 9, an innovative and imaginative team who also produced 'Heavy Gear', the roleplay game from which the exoarmour computer sim of the same name was developed. Visit their web-site to see some of their other hardware - they're some of the best manga-style designs ever. Not that I'm implying scurrilous plagiarism; the Sulaco has been imitated so many times because it is such a fantastic piece of design, and well worth drawing on for other works. Below I've shown my own designs based on the Conestoga class. In the Colonial Marines Technical Manual (see the Books section of this site), Lee Brimmicombe-Wood briefly mentions other types of starship employed by the USASF. My designs are inspired by that reference. The smaller versions of the ships shown at the top of the page allow a comparison of size with the Sulaco. Addendum: the Sulaco is described as a 'Conestoga' class ship in the technical manual and a variant appears in 'Aliens versus Predator' called the Ferrarco which is designated a 'Costanoga' class. I'm aware of the origins of both the names "Nostromo" and "Sulaco" from the novel 'Nostromo' by Joseph Conrad, but not the above. If you know, send me an email. The 'Ohio' class interdiction and patrol vessels have played a small but vital role in almost every planetary campaign engaged in by the USCMC since the vehicles commissioning in '66. The airframe is an asymmetrical layout like the Conestoga class, but with a greatly reduced cargo capacity since the Ohio ships are utilised as dedicated minelayers. This frees up the assault class ships to be used exclusively as mobile dropship and strikeship platforms in planetary disputes where aerospace superiority is an essential goal. The Ohio class, conversly, carries only a single surface contact ship, primarily as a crew lifeboat. The majority of its arsenal is composed of two types of aerospace mines, supplemented by the Ferrini/Militech Industries 'StarShield' Orbital Barrier Nets. A battery of twelve surface observation and communication satellites are also carried and can be launched into orbit to form an intergrated network with the mothership that provides up to date information and early warning for all friendly vessels. Having only a moderately powerful reactor, no particle beam weapons are carried by the Ohios, although they are armed with a dorsal and ventral railgun turret pairing and port/starboard laser arrays for point defense. The Ohio ships were the basis for the shortlived 'World Watch' Planetary Defense Program, a policy of erecting large, permanent defense networks over many of the newly terraformed colonies on the outer veil. The project was hastily withdrawn following unanticipated and almost unanimous rejection by ICC member states. The Shirow is an example of the 'Okinawa' class assault carrier that has functioned as a capitol ship amongst the USASF fleet for over twenty years. The sheer size and power of these vessels almost constitutes psychological warfare in itself, especially when coupled with their impressive performance record: no Okinawa ship has ever sustained catastrophic damage. The Okinawas' primary offensive role is that of a strikeship carrier. Most of the forward hull consists of three vast hangars capable of containing a total of twenty-two dropships or strikeships. Having a considerably greater beam, or width, the Okinawas also possess four launch bays that can deploy vehicles simultaneously at a rate of four launches every six minutes under combat conditions. Although normally deployed in conjunction with a larger task force, the Okinawas must occassionally defend a low orbit zone alone. If challenged by enemy vessels, they are fully capable of defending themselves. The surface attack ordnance is probably the Okinawas' most intimidating feature. The standard E52 Blacklight orbital strike missiles carried by most USASF vessels are arranged in two batteries along the underside of the mid-hull, below and to the sides of the ventral spine-shaft. Fourteen of these single head, twenty megaton nuclear weapons are carried as standard by any Okinawa, and the aftmost vehicle hangar can be converted to carry an additional eight Blacklights when mission parameters dictate. In addition to this, the most recent inclusion in the fleet's tactical aresenal is the HH31-Aurora. These unidirectional cluster bomb weapons carry eight hundred kilos of phased plasma apiece in sixteen magneto-segregated holds and are guided prior to launch until detonation by integrated S2 computers. The S2 are one of Hyperdyne Systems so called 'brilliant' military grade, system-regulating synthetic cerebra and as such are usually interfaced directly with the onboard intelligence of their parent ship. This gives near-instantaneous prediction and calculation for the optimum launch pattern; the Aurora is an atmospheric insurgent, being influenced by and relying on accurate assesment of the planetary conditions. The clusters are typically fired in groups of three or more and are detonated at medium to high altitude whereupon, assuming the correct pattern has been issued, the plasma de-phases and spreads to saturate the target area with the most efficient time/burn ratio. Detonation can be set to much lower altitudes to ensure maximum impact but this is regarded as a waste of the weapon's potential; large areas of terrain infested with infantry and light armour are the intended target for the Aurora. Conceivably, given an unusually low altitude and compact spread selection, the Aurora could effectively destroy the population and much of the surface structure of any large colony or similar target, although there is no official confirmation of such a concentration of firepower being directed at a major conurbation. The Okinawas carry sixty Aurora clusters, located to the rear of the vessel between the reactor cores where they can be ejected in emergencies along with the engine plasma. I'm rather pleased with the overall shape of this design: just as the Sulaco resembles a gun in space, the Shirow looks not unlike a large sword or combat knife. The Shirow is more than a ship, it's a force unto itself. At the outset of the Linna campaign, we hauled into low orbit while the interdiction ships were still deploying the surface-detection sats. We kept the Shirow on an active defense state; its sensors are wide enough to protect itself and any other vessels in a compatible orbit for 5000 clicks. That means the ship will react to deflect or destroy projectiles as soon as the enemy aerospace launches are detected, regardless of the trajectory. The thing is, it's not supposed to retaliate against the installations themselves without confirmation or intervention from us, otherwise it could saturate our own groundware when the enemy fires on a shallow track. We picked up the launch of an eightfold MAGNAlance pattern far south of the principal population centre, their active homing screaming as they reached the stratosphere and all of them heading for the Shirow due to its larger EM profile from the ventral antenna. The Shirow took this rather personally. It instantly powered the particle beam cannons and directed fire at the warheads, frying all eight in rapid succession and turning two into 'deadheads' before they made atmospheric break. But that wasn't enough for the Shirow - according to StratCom our own divisions were deployed half a continent away, and weren't expected to engage the rebels until aerospace superiority had been achieved. The Shirow considered that safe enough: it armed two strike nukes and dropped them on the position of the launch, much closer together than is usual. Even from orbit, the detonation looked like the fires of hell. Several days later, we got the word from surface command that they'd reached ground zero, and tried to confirm the remains of an ASAT installation; there was nothing left - nothing. They had to redraw the territory maps for that one. Seems the Shirow was dead on. Sometimes, I think its AI enjoys playing god.